There are several hotels near Tampa Port that offer attractive accommodations and a good price. These affordable Tampa Port hotels put you and your family in an ideal position to enjoy the attractions of Tampa before or after your inclusive Caribbean cruise. The Tampa Cruise Terminal's address is: 651 Channelside Drive, Pier #2, Tampa, FL 33602. This address puts the cruise terminal just 9.5 miles from the nearest airport and therefore a short ride to hotels near Tampa Port, as well as within close proximity to the city's top attractions. Busch Gardens, Armed Forces Museum, Theme Parks, Fine Beaches, Straz Center for the Performing Arts and many pristine golf courses. There is much more to do and see in Tampa! Find the best deal, compare prices, and read what other travelers have to say at TripAdvisor. 1. 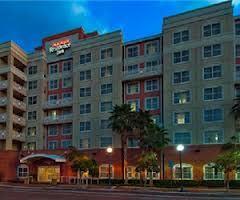 The Howard Johnson Plaza Hotel is a reasonably priced hotel near the Tampa Cruise Port. Customer Rating: 3.6 out of 5. The Howard Johnson Plaza Hotel is located in City Center. It is a short distance from the nearest airport and is ideally located close to Busch Gardens, golf courses and the Tampa Bay Center Mall. The hotel has an outdoor swimming pool and a fitness center/gym. 2. 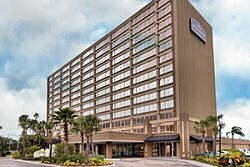 The Wyndham Tampa Westshore Hotel is a more highly priced hotel near Tampa Port. TripAdvisor Rating: 4 out of 5. 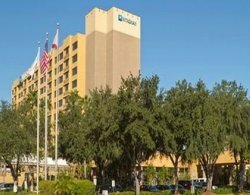 The Wyndham Tampa Westshore Hotel is located just about 2 miles from the airport and is ideally located close to golf courses and the Tampa Bay Center Mall. This hotel features Jacuzzis, free airport shuttle and a fitness center/gym. Above are just 2 of many hotels hear Tampa Port. For information on several other hotels near Tampa Cruise Terminal, see below. Howard Johnson Inn Tampa Ybor City: Find the best deal, compare prices, and read what other travelers have to say. Quality Inn & Suites: Find the best deal, compare prices, and read what other travelers have to say. Hilton Garden Inn Tampa Ybor Historic District: Find the best deal, compare prices, and read what other travelers have to say. If you still have not found the hotel that you seek, you may prefer to use the TripAdvisor Search Box below to expand your search. Cruise passengers can fly into the Tampa International Airport (TPA) which is only 20 minutes or 9.5 miles from the cruise terminal and nearby hotels. Your family can easily get to your hotel by taxi or by a shuttle ride. 1. Shared Shuttle Service - SuperShuttle - (800) 282-6817 or (727) 572-1111 - Call for pricing! 2. Taxi Service - Taxi cab service is provided from the Commercial Ground Transportation Quadrants located in all four corners of the Baggage Claim Level. The airport is served by Yellow Cab and United Cab. Both companies charge the same fares: $2 plus $2.25 per mile. The minimum fee from the airport is $15. Once the meter exceeds the $15, the minimum no longer applies. There is a maximum flat rate fee of $25 to Downtown Tampa and the cruise port. Your best bet is to use the taxi service as your family will save by paying the flat rate fee to hotels near Tampa Port and the Tampa Cruise Terminal. 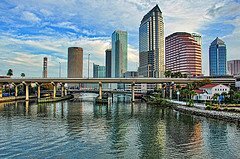 I have given some you basic information about hotels near Tampa Port and some top attractions in the city. 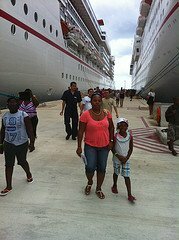 I hope you will find this information helpful as you plan your inclusive family Caribbean cruise. Please visit us after your Caribbean cruise and share your cruise story with us.